Traveling with kids can be complicated. I usually (always) over-pack. We can never fit all the suitcases, toys, stroller, crib, cooler, and boxes of wine without packing and unpacking the van 3 or 4 times. We have to find hotel rooms that can hold all 5 of us. We need to stop 3 times per hour because they never ever have to pee at the same time. Planning and planning again is the only way I survive. And then I need a vacation after my vacation. Just for me. 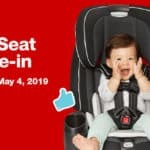 Over the years of traveling with kids I have found some of the most useful products to make our family trips just a little easier on me. 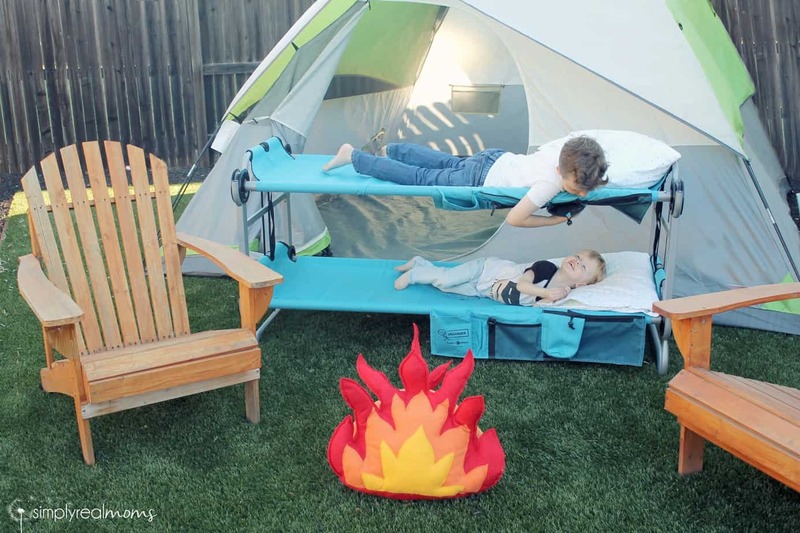 This year’s new travel essential for my boys is the Kid-O-Bunk. I first saw the Kid-O-Bunk last fall at the ABC Expo in Las Vegas-a trade show for all things baby & kids. It caught my eye and I was immediately sold. 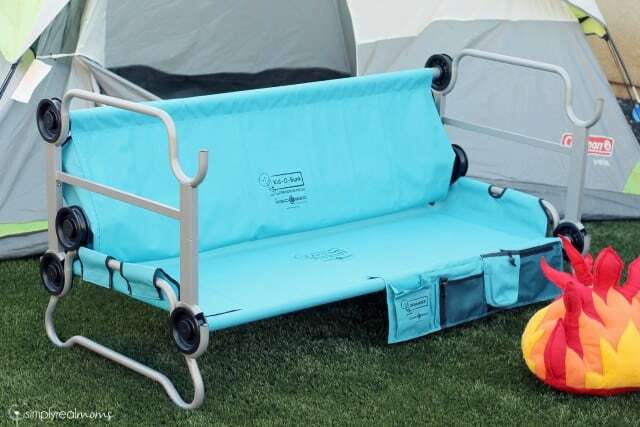 The Kid-O-Bunk cots are camping and travel cots that are bunked! Travel Bunk Beds! Mind=Blown! With three boys and family all over the U.S. this seemed like an answer to the space problem while traveling! So we got a set before the upcoming summer vacation season so that we could be prepared and take up a lot less space! 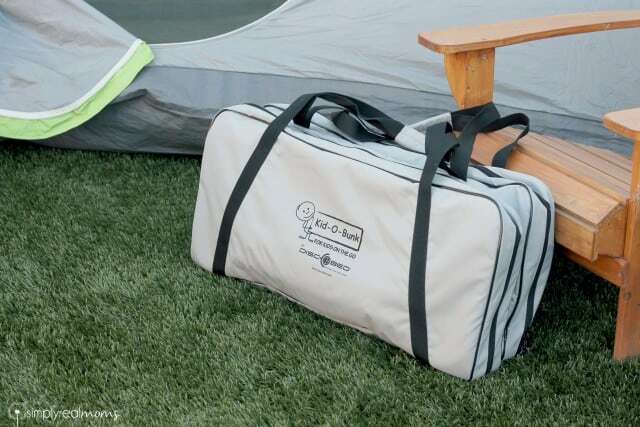 The Kid-O-Bunk cots break down easily into two separate carry bags. They have shoulder straps for easy transfer from point A to point B, and are flat-making storage and roadtrip packing simple! Everything you need for each cot is held in place by either velcro straps or elastic loops. 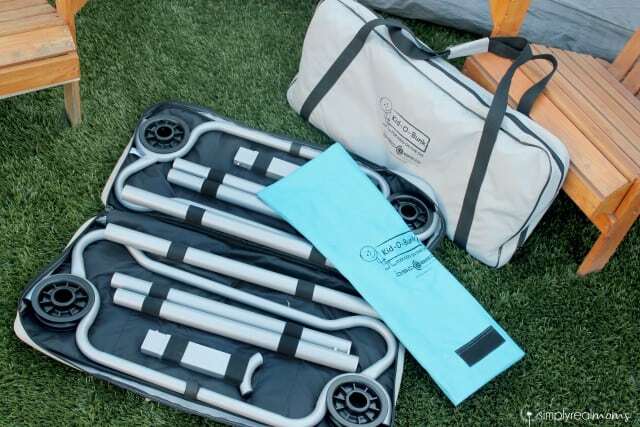 There is also a visual aid to help you to re-pack it correctly (and set up the cots). We love that these cots can be used so many different ways. WHERE you use them-camping, hotel rooms, grandma’s house, sleepovers etc. Don’t worry about how dirty they get, either! The bed decks are machine washable. 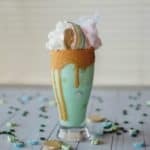 This is a necessity for after camping or really any time it’s used by my kids. WHO uses them-each cot can hold up to 200 lbs, so young children up to adults can even use them. Seriously. 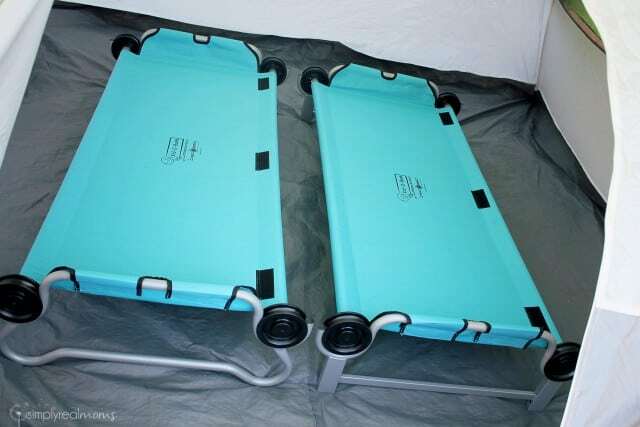 My husband and I tested that theory and both lay on the cots while in bunk mode and were impressed with the sturdiness and comfort of the cots! 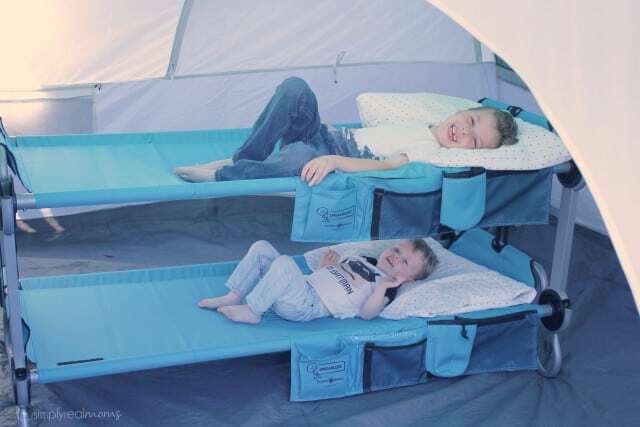 HOW you use them-they can be bunk beds, single cots or a couch! I love that the two cots are stored separately. If one of your kids is headed to a friend’s house for a sleepover they can just take one of the bags along-no need to have both! This is such a cool feature. 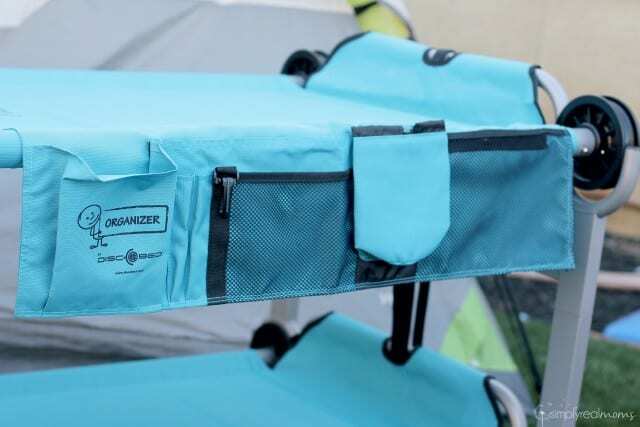 Each cot has a velcro area to attach an included organizer. This way, each child can place their books, personal belongings and even shoes while camping! None. No Tools. I have a very handy husband who owns every tool there is, but I love that there’s no need to pull out any screwdrivers or wrenches to build these cots. They snap together easily and securely and use a simple buckle strap to add extra security in keeping the top and bottom bunks stacked together tightly. 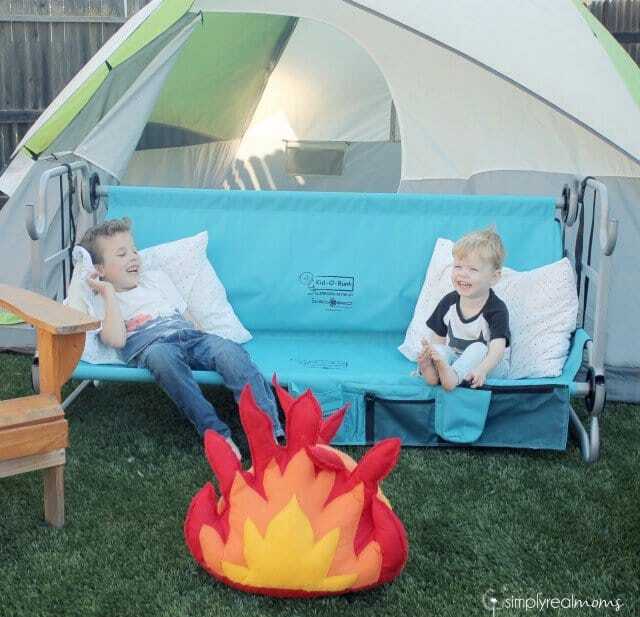 We absolutely love our Kid-O-Bunk cots and my boys look forward to getting them out each time we travel. I love that they now each have “their” claimed bunk, but usually end up sharing one during story time or to play with cars together. The only downside I’ve noticed is that they are a bit on the heavy side-not too heavy for an adult to easily carry but my son definitely won’t be carrying his own cot for a while. 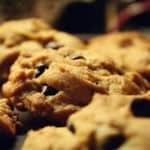 It’s a silly complaint but good to know! 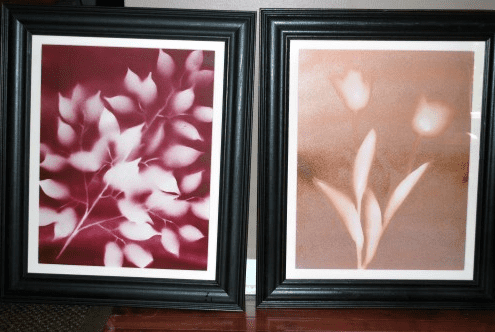 The setup was slow and slightly confusing the first time we set them up since they were a totally new thing but once we used them once we were pros at setup and takedown, as well as storage. I feel like I don’t need the instructions at all now (although we keep them in the bags just in case…they are very detailed with great visuals). Check out Kid-O-Bunk for yourself! 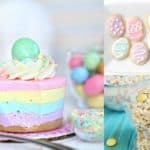 Right now they are offering a great discount for our readers! 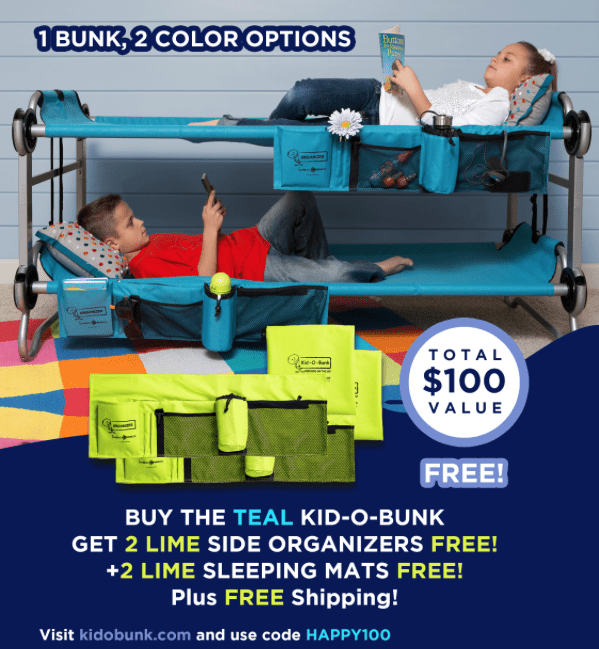 Buy the teal Kid-O-Bunk set, receive the lime sleeping mats and organizers for FREE! This is a $100 value and gives your kids the option to have whichever color bunk they prefer! You’ll have a set in each color to alternate between! Simply use the code “HAPPY100” while checking out between now and June 30th 2016. We received product for review purposes but all opinions are our own. Wild Kratts Makes A Splash With “Lost At Sea” Special! Ok these are SO awesome!!!! 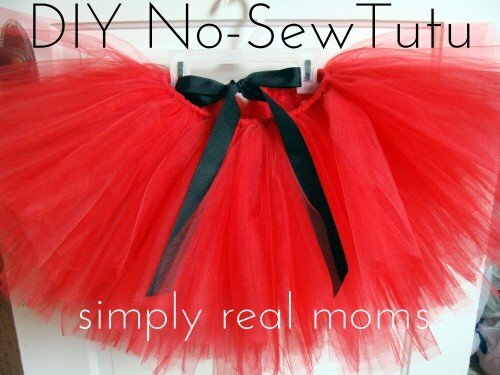 What a fantastic idea…..if u can afford it!!! I tried to use the code and it didn’t work. Any suggestions on what I might be doing wrong?